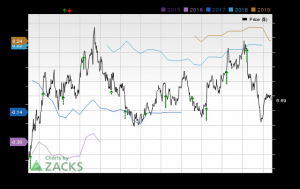 Will Lower Revenues Hurt Juniper's (JNPR) Earnings in Q3? Juniper Networks, Inc. JNPR is scheduled to report third-quarter 2018 financial results after the closing bell on Oct 23. In the last reported quarter, the company delivered a positive earnings surprise of 11.6%. However, it is unlikely to report higher revenues in either of the operating segments due to volatile demand and intense market competition. Whether this will hurt its bottom-line growth for the quarter remains to be seen. During the third quarter, Juniper introduced a 5G-ready firewall processing card to meet high security requirements. The company’s SPC3 Advanced Security Acceleration card offers an 11x performance boost to its line of SRX5000 Services Gateways. The SPC3 Advanced Security Acceleration card enables cloud providers, service providers and enterprises to meet the growing security demands of multicloud, Internet of Things, 5G as well as enterprise edge. The company has also launched a cost-effective cloud solution for service providers. Dubbed the Contrail Edge Cloud, the product offers a full-fledged secure cloud experience to the space- and power-constrained edge network, which includes base stations, hub sites and switching sites. The Contrail Edge Cloud solution provides automation, security and analytics features to facilitate service providers in deploying dynamic consumer and enterprise services in a cost and resource-efficient manner. Furthermore, Juniper announced that it was selected by WorldLink — the largest Internet service provider in Nepal — to supplement its networking solutions in order to cater to the exponential growth of data traffic in the country. The move facilitated Juniper to develop the networking infrastructure of Nepal and enable its smooth transition to a high-speed 100GbE backbone network. During the quarter, Juniper announced that Malaysia-based communications solutions provider TIME dotCom Berhad used its vSRX solution for rolling out the latter’s latest suite of virtual managed services for enterprise customers across the country. Also, the company announced that it was selected by Vodafone as one of its Software-Defined Wide Area Network vendors for its enterprise-focused SDN portfolio. Despite the positive developments, unfavorable global macro environment and weak investment patterns among customers are likely to hurt Juniper’s revenue growth. Ongoing consolidation in the telecom market is also expected to weigh on the company’s financials. Moreover, Cloud revenues, which are expected to be $279 million in the to-be-reported quarter, is posing challenges as it is passing through a transition phase. For the third quarter, net revenues from Routing are expected to decrease to $478 million from $586 million a year ago. Net revenues from Switching are expected to increase to $244 million from $213 million and the same from Security is likely to improve to $81 million from $71 million. The Zacks Consensus Estimate for revenues from the Product segment (comprising Routing, Security and Switching products), which accounts for the lion’s share of total revenues, is currently pegged at $798 million, down from $870 million reported in third-quarter 2017. Revenues from the Service segment are expected to decline to $375 million from $388 million. Consequently, total revenues for the quarter are likely to decline to $1,174 million from $1,254 million reported in the year-earlier quarter. Earnings ESP: Juniper’s Earnings ESP, which represents the difference between the Most Accurate Estimate and the Zacks Consensus Estimate, is +3.18% as the former is pegged at 46 cents and the latter at 44 cents. You can uncover the best stocks to buy or sell before they’re reported with our Earnings ESP Filter. Zacks Rank: Juniper has a Zacks Rank #3. This increases the predictive power of ESP and makes us reasonably confident of an earnings beat. 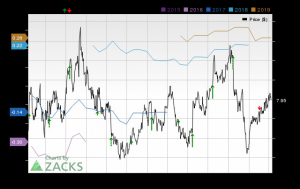 Helix Energy Solutions Group, Inc. HLX has an Earnings ESP of +8.33% and a Zacks Rank #1. You can see the complete list of today’s Zacks #1 Rank stocks here. Arch Coal, Inc. ARCH has an Earnings ESP of +6.32% and a Zacks Rank #1. Viper Energy Partners LP VNOM has an Earnings ESP of +1.57% and a Zacks Rank #1. More posts about Helix Energy Solutions Group, Inc.